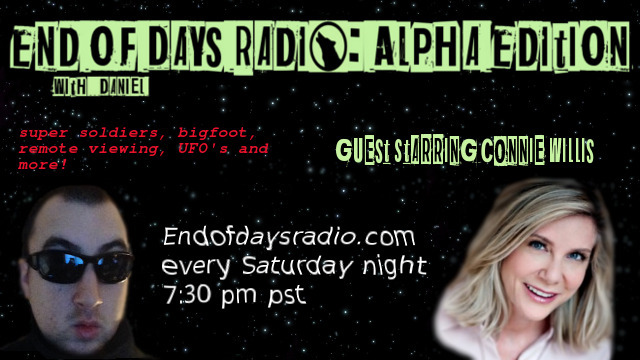 Fan favourite EODR caller Todd Miller joins us for a very exciting alternative adventure. Todd has wanted to tell his story for a long time but was never given an opportunity until now. We begin by learning of Todd’s past. how he was taught to read at an early age which then led him to the used book store of dreams where he found his first conspiracy book. The conversation then takes a turn to the dark side as Todd educates us about Chaos Magic, Crowley and the Golden Dawn all while completely hammered. Things take an even weirder turn as Daniel randomly brings up Tom Brady which prompts a hammered Todd to complain about the Patriots quarterback and accuses him of “inflating superballs”. We circle back to more serious topics such as mind control of the masses and Bohemian Grove. Todd Miller joins me this Saturday! We are joined this Saturday by Todd Miller who was doing what Daniel does long before Daniel was even born. Meaning he was going up against the man and trying to enlighten the world to the grand conspiracy pre-internet days. 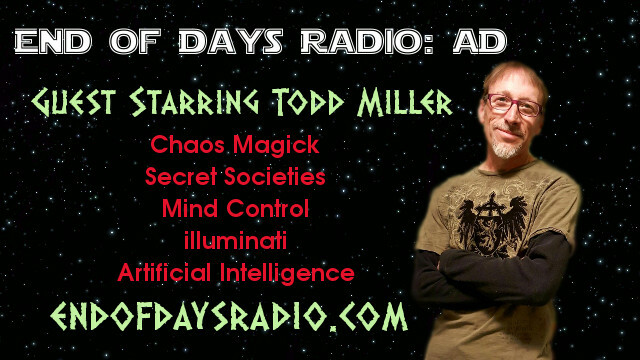 Todd has been a long time fan of End of Days Radio and has wanted to get his story out for a long time. We are going to take a journey into the past and learn about how the Chaos magicians tried to save us all! We will talk about everything including William Cooper, HP Lovecraft, Black Sabbath, Chaos Magick, Crowely, the birth of the Illuminati, mind control history, missing people and much more! Daniel starts off ranting about all kinds of things such as Japanese food and the truth behind Atlantean civilization. He is then joined by Connie Willis who is a part time host of Coast to Coast AM. She is also the host of her own exciting emerging program Blue Rock Talk. Connie talks to us about her beginnings in radio as well as what exactly got her started. We learn of the haunted house she grew up in and talk a bit about the afterlife which Connie strongly believes in. We then get into some deeper discussion as Connie gives her take on several topics from A to Z including Hybrid children, negative aliens, Travis Walton, remote viewing, super soldiers, mantis aliens and the concept of the pineal gland being suppressed by negative forces. Connie then turns the tables on Daniel and gets him to open up about a very personal experience he had years ago in the jungles of south America. They chat for a bit about Bigfoot throughout this program as well. It is a truly exciting and interesting interview from start to finish as both host and guest sit back and have a real conversation about how to turn heads while trying to promote a paranormal talk radio show. We then come back from break and Daniel talks about a handful of relevant topics. He then gives a very special shout out to Bellgab before explaining what his favourite paranormal topic is. Todd calls in as well and hilarity ensues. This Saturday I interview Connie Willis! I am super Excited to talk to Connie Willis from Coast to Coast AM! This is Daniels first ever broadcast on his own.